Is it written that the only permanent solution to under-eye bag removal is surgery? It is written that the only permanent solution to under-eye bag removal is surgery. Is it really permanent? Go ahead, ask a surgeon. Some will tell you the longevity of any cosmetic improvement varies, based on many factors, such as how well you take care of yourself. Some like to say a decade as standard rule of thumb. Surgery does not stop the aging process. Therefore, you may find yourself with the same recurrence or new age related designs around the eyes. Additional eyelid surgeries are considered revisions, meaning corrections to the original. Depending on your age at the time of your cosmetic procedure; a future revision is certainly not out of the question. Any cutting procedure, surgery, goes hand in hand with risk. The more often a procedure is performed the more risk there will be. Now add the delicate under-eye area. The risk is now that much greater. Infection, scar tissue, changes in vision are just a few. Surgical removal of under-eye bags can be pricey. The bills include fees from the surgeon, anesthesiologist, hospital, lab and pharmacy. The national average cost is approximately $3,500.00. And, most insurance companies do not cover cosmetic procedures or any expenses related to a cosmetic procedure. The expenses may be 100% out of your pocket. This article is not meant to sway one way or another. It is assumed that any surgical candidate will discuss all the pros and cons with a qualified medical professional and make an educated, well-informed decision. What to do? What to do? At the end of the day, we will do what makes us feel best. However, finances may prevent some from choosing a long-term solution. We cannot stop Father Time, but in the meantime, we can hide him well with Plexaderm. 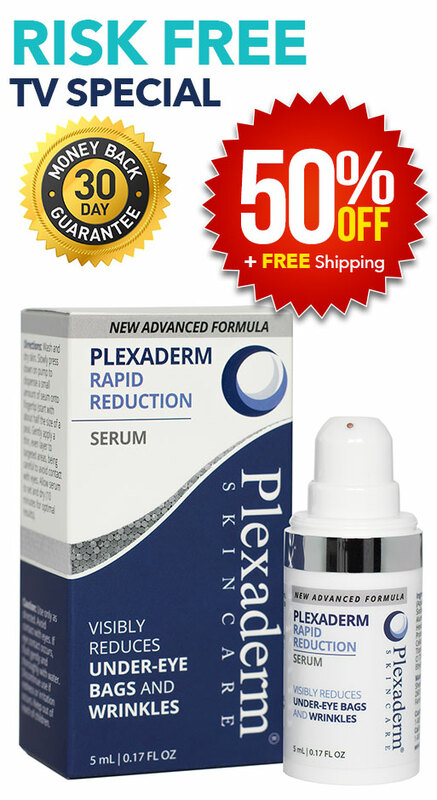 Plexaderm results are not permanent, but it’s a great option for visibly reducing under-eye bags and wrinkles, and it works in minutes.